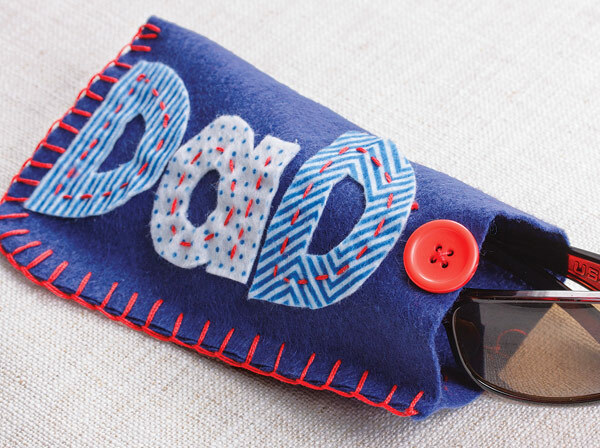 A fantastic handmade gift idea for Dad to store his sunglasses. A handy gift that Dad will really appreciate! Cut a piece of 20 x 30cm Felt in half and then fold in half lengthwise. 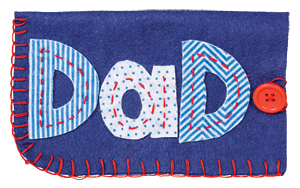 Cut out letters "DAD" from the Printed Felt. Arrange the letters onto the pouch and attach by using a running stitch down the centre of each letter. Stitch on a button at the end of ëDadí. Pin the open edges of the pouch together. Use blanket stitch around the edge of the pouch with Perle Cotton. Create a loop with the cotton to wrap around the button so that the pouch can be closed securely.